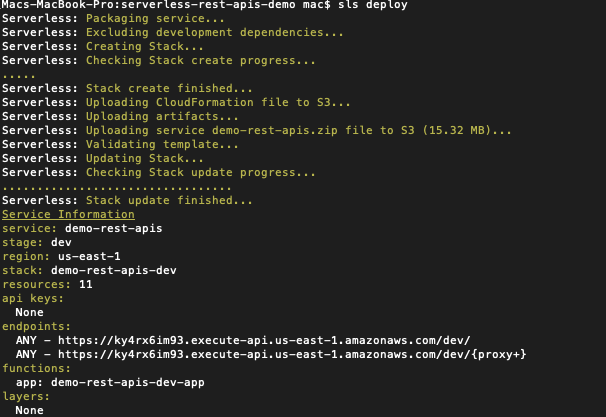 When i first tried to deploy my existing nodejs rest APIs in Serverless it took quite long time to figure out the way. So i’m here to share the process which i figure out to deploy our existing apis in Serverless. Lets get into the process..
Open your terminal and go to the project folder, Install serverless globally by typing the below command. Note : serverless-offline plugin is basically for offline testing. Now you are all set to deploy your application in serverless. It’s time to deploy now…. Yeyyy…. Here you go, your APIs deployed in AWS Lambda successfully. Click here to find demo project github repo. If you have any questions, please leave a comment below. By the way this is my first post.